Austin, TX is *full* of fun food trucks and food trailer parks. Did you know that? I didn’t. They are everywhere and it’s awesome. We had plenty of reasons to spend the month of January away from the northeastern chill of NYC, soaking up the warmth of Austin, but soon found out that the food there was an extra bonus. Quite a few trucks were on my “Must Eat” list and Holy Cacao was one of them. 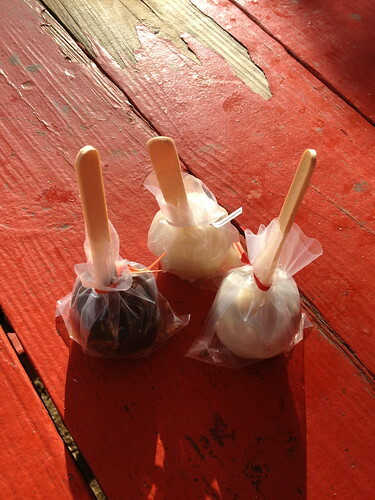 They sell cake pops. 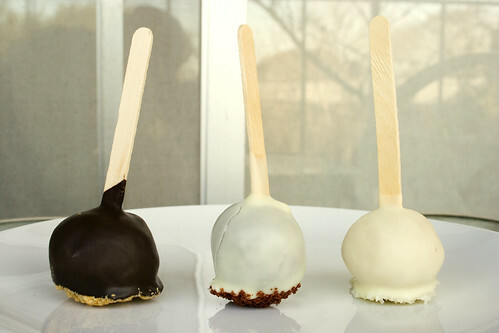 Cake pops seem to be everywhere these days and yet I had never really tried one. 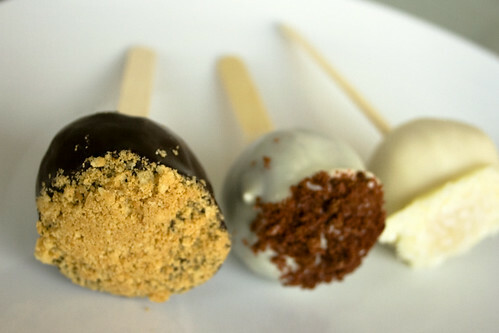 We picked up three at Holy Cacao – Brass Cake Balls (chocolate peanut butter), Wedding Cake (vanilla) and Velvet. 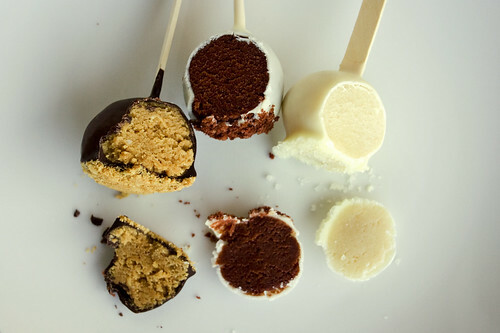 These cake pops are the mullet of dessert. Why? and a party on the bottom. They’re much tastier than a mullet, though. At least I imagine, since I’ve never actually tasted mullet. Ew. Hey look, a cross-section shot. Neat. I loved them all. The chocolate coating was firm but thin enough that it cracked easily as you bite into it. The vanilla cake was very sweet and the sprinkles on the bottom added just enough texture to balance the soft filling nicely. The red velvet was well-balanced all around. It didn’t taste too strongly of cream cheese or food coloring – it was just perfectly sweet, cocoa-flavored, moist and tasty. Our favorite of course, was the chocolate peanut butter, which was made with good peanut butter and also perfectly sweetened. I thought that this was the perfect truck food – easily transportable, kitschy, fun and delicious. 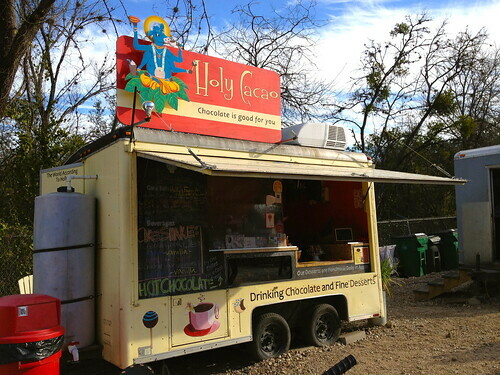 If you find yourself in Austin, stop by Holy Cacao.